← Resurrection – A Natural Adaptation in Yellowstone! Last Thursday, invited by my friend Sam S. Vasan, I attended a dinner meeting of the AIChE ( American Institute of Chemical Engineers) held in Walnut Creek. The speaker was Prof. Anastosias Melis, a Biochemist from U. C. Berkeley, and the topic was Photosynthesis-to-Fuel. Professor Melis presented the results of his research in which he is genetically modifying bacteria to directly convert sunlight into hydrocarbons. This technology has a lot of promise and is on the doorstep of commercialization. If implemented it can provide us with a solar source of energy that has big advantages over photovoltaics in cost and storage. The key player in this technology is a single cell creature, called cyanobacteria, that is mass produced in nature as blue-green algae. 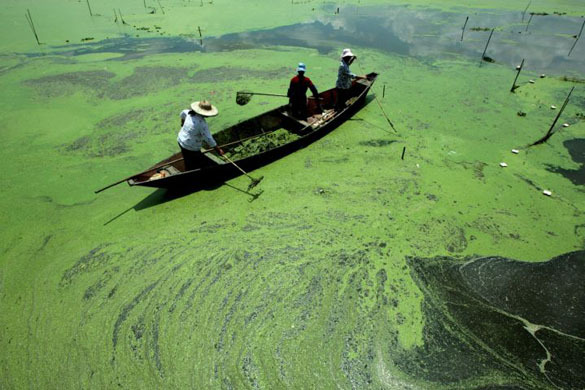 It blooms fast and abundantly on bodies of water, such as lakes and seas – creating a blue-green scum like appearance. This little organism has developed a fantastic trait – photosynthesis, which means it uses chlorophyll (and carbon dioxide and water) to gather light and convert it to energy. Once the conversion is complete, the organism stores that energy as sugar, while releasing oxygen as a byproduct. 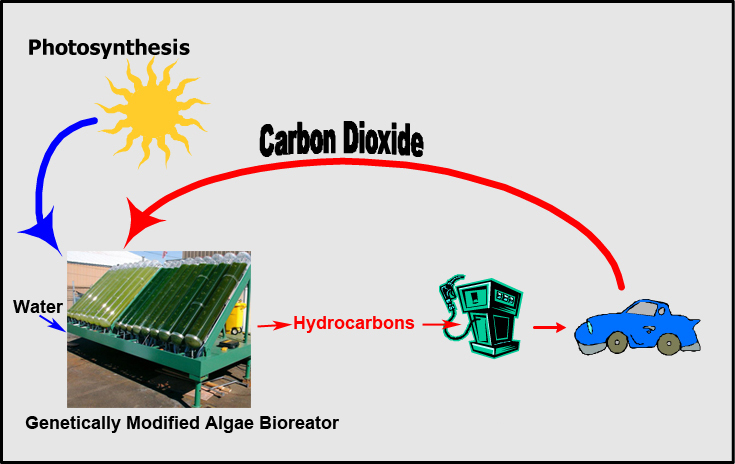 Blue-green algae in various forms are responsible for about 20% of all solar energy conversion to bioenergy in the world. Their total production is 450 trillion watts or (TW), 24 hours a day as there is sunshine somewhere all the time. Compare this with peak energy usage by mankind of about 8 TW. These algae also use up CO2, which solves yet another problem for us – carbon induced global warming. (The carbon is released back when the photosynthetic fuel is burned, so no net carbon released into the air for the cycle). The trouble with the photosynthetic activity of these cyanobacteria is that they produce sugars and other products not easily usable by our industries as energy sources. What if we could induce these organisms to directly produce hydrocarbons that we can burn in cars or generate electricity with? It would be a great, non-polluting assist to our energy needs. Professor Melis described how his research has produced genetically modified cyanobacteria that can do just that – they can modify the products of their photosynthesis to produce a hydrocarbon called isoprene (C5H8) which is easily storable as a liquid without having to freeze it (it boils at 34°C or 93°F). The algae cells still produce sugars and other biomaterials they need to replicate and live, but 16% of their sunlight conversion now goes into the usable hydrocarbon. See Prof. Melis’ paper describing his research here. Professor Melis, to show scalability of his lab results, built a “bioreactor” in his backyard which uses a cubic meter of algae, CO2 (in Baking Soda form), and water to produce and trap hydrogen. He used stock materials picked up in a hardware store and aquarium supplies. He has since refined the process to produce the more usable isoprene instead of hydrogen, which is difficult to handle. His gizmo can provide clean energy, sufficient enough to supply an individual household needs, any place the sun shines. The results of this and related research have excited many investors/entrepreneurs and Prof. Melis says he is receiving numerous inquiries from venture capitalists. The economic tipping point for commercialization, he says, is a production ratio of 20% isoprene. He is still tinkering with the algae genetics and other parameters to achieve that result, which he says is within sight. No expensive manufacturing or rare earths required. 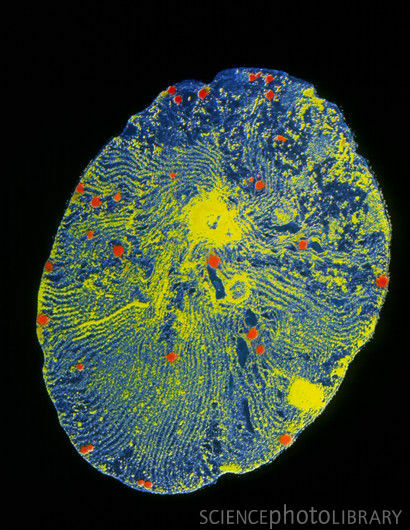 The cyanobacteria once genetically modified, can replicate themselves fast and indefinitely. The hydrocarbon produced is very versatile and can be used in many industrial processes directly. It can be stored much more easily than, say, hydrogen in liquid form and shipped safely. 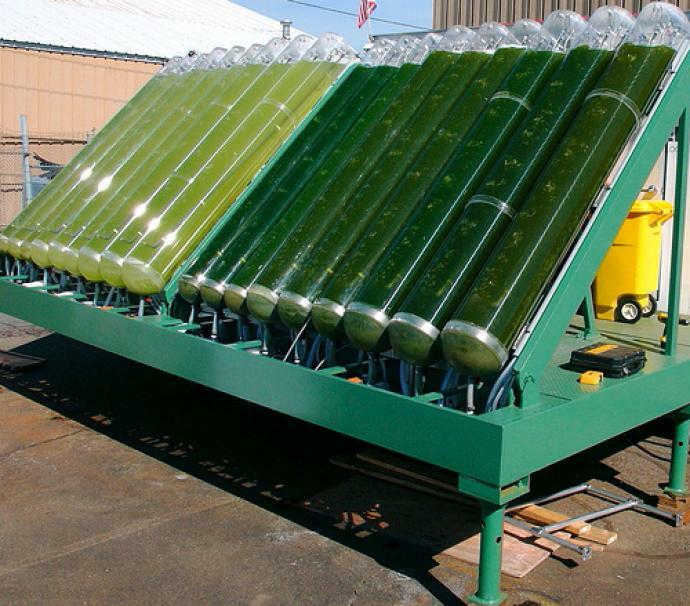 The bioreactors can be built in remote or waste areas where the sun shines and algae reactor farms can be built. Transmission lines are not required as for photovoltaic electric generation plants. The costs have been estimated as low: just a few cents for a gallon equivalent of gasoline, if a viable, scalable technology is implemented. This is not some pie-in-the-sky radical environmentalists’ pipe dream. It is mostly here and has great promise. Wanna do a new start-up? Just like when Rudolph Diesel figured out you can burn most oils in a compression ignition engine, I guess what needs to be sorted out is how to actually handle such a fuel from the combustion point of view – viscosity is the main issue. If it is way too fluid, then there are viscosity enhancers, but these are solvable problems. Then we need to see the emissions, but here again different combustion techniques are workable. Good reading – would like to continue receiving updates on this topic. It would be interesting to see a more detailed flowsheet of Prof. Melis’ backyard bioreactor to find out if hydrogen could be siphoned off directly in the gaseous form. In this context some other useful applications come to my mind. Prof. Melis not only can siphon off hydrogen gas directly, he had to work quite hard to do the next step of producing isoprene. This is because hydrogen is harder to store and transport. Producing hydrogen using his process is a snap. He produced large quantities of it and just bled it off into the atmosphere in his “lawn” bioreactor. 900 different types of plants we are deploying this at.